April is a rainy month. Spring rains bring May flowers. But they can also bring some boring afternoons when it is too wet outside to play. On those days, we have to find things to play with inside the house if it is too stormy to go outside. At the 1900 era farm house, Living History Farms shows kids what it would be like to live on a farm over 100 years ago—without electricity and video games or televisions. Kids had to find things to do when it rained just like we do now. On a farm, children could play in the barn on a rainy day. They would still be out of the rain, but not shut up in the house. They might jump around in the hay loft, or curl up in the hay and read a book. They could play “let’s pretend” games and pet the cats on a rainy afternoon. 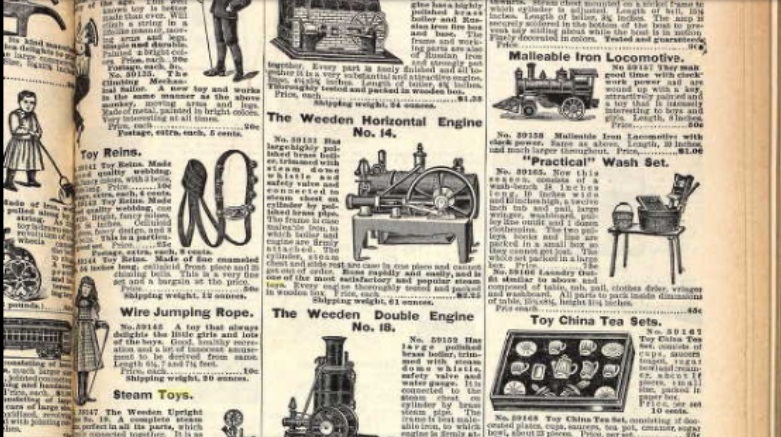 By the year 1900, families could also buy toys out of catalogs! Companies like Sears or Montgomery Ward had dozens of pages of games and toys in their catalogs—if kids and families could save their money up to buy them! Town kids who lived in the 1870s might not have a barn to go play in; they might have to play in the house. There were some store-bought toys that these children could play with if their family had spent a little money. 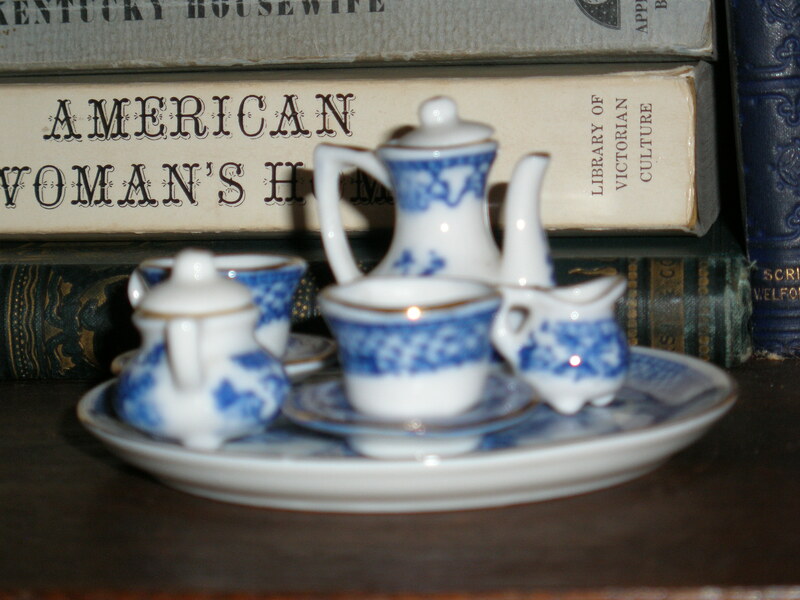 Wealthier families might buy metals trains, or rocking horses, or fancy dolls and tea sets. There were also many magazines and story books for children. They could read stories and riddles out of the “The Youth’s Companion” on a rainy day. Look at the kinds of stories and puzzles kids read here. 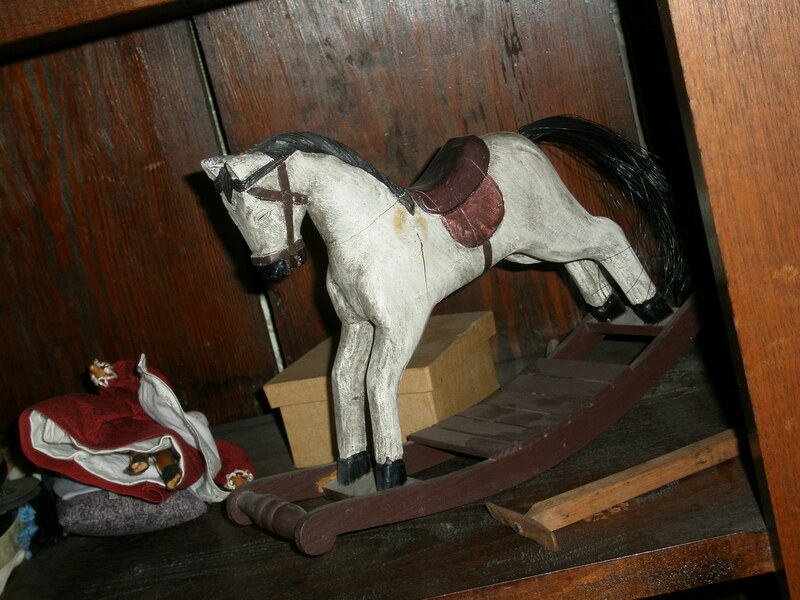 Other toys could be made at home. Older boys might carve wooden tops or cup and ball sets. Girls might make handkerchief dolls or sew their own doll clothing. With some blocks of wood and ribbon, a clever child could make a Jacob’s Ladder. To make a Jacob’s Ladder, the ribbons are glued between the blocks. When flipped, the blocks look like they are magically falling back and forth. You can see the Jacob’s Ladder in motion in this video! Children could also make paper dolls, soldiers, and action figures without buying them, just by cutting them out of scrap paper. For children who had brothers and sisters or friends who lived close by, there were lots of games to play in the house on a rainy day. Sometimes the games needed props, like cards or checkers. Playing cards did look a little different in the 1870s! They didn’t have numbers on them until the 1880s. Players would have to count the hearts or diamonds as they played. A good card game for kids in 1875 would have been “Snap!” Snap can be played by 2 to 4 players. Deal out the playing cards evenly to the players face down. Each player around the circle takes his turn by turning over his top card. If anyone turns over a card that matches a card already showing, the owners of the cards race to yell “Snap”! 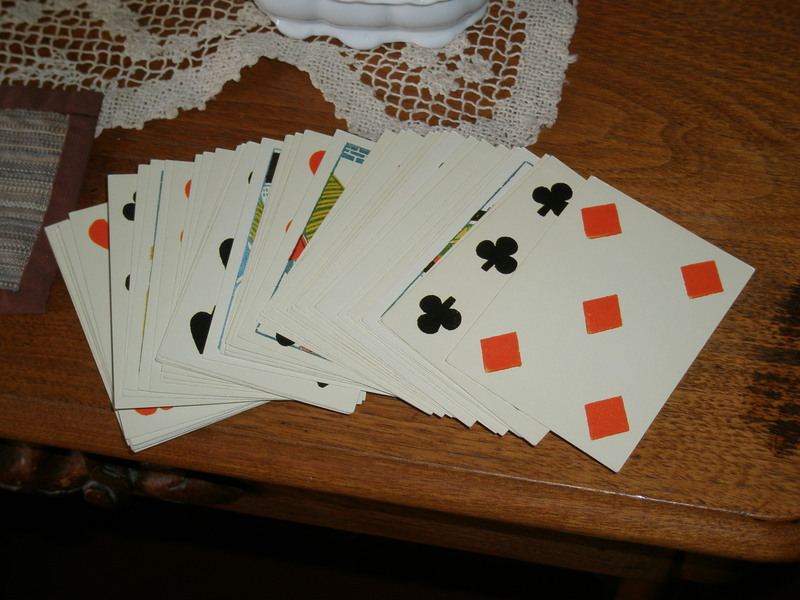 The player who says snap first gathers all the cards into a separate pile and the play continues until one player has ALL of the cards. A favorite group game was “Throw the Handkerchief”. The group of children sat or stood in a wide circle except for one person in the middle. A light handkerchief was tossed from a person on one side of the circle to someone across from them. The person in the middle tried to catch it before it could get there. All players had to keep their feet, or bottoms if sitting, in the same place. They could lean to try to catch the handkerchief, but couldn’t step out of place. If the person in the middle could catch the handkerchief, he or she changed places with the person who threw it. If a group had a long piece of yarn and a ring or a large button, the children could play “Hunt the Ring” or “Who has the Button?”. Thread the ring or button onto a very long string and tie the two ends of the string together. All but one of the players sits in a circle and takes hold of the string, pulling it tight between the players. Someone has the ring or button in their fist, hiding it. The last player stands in the center. The players in the circle begin passing the button or ring from person to person along the string. The player in the center tries to guess where it is. A slightly quieter rainy day group game was “Hunt the Thimble”. All the players but one were sent out of the room. The person who was “it” hid a plain sewing thimble somewhere in the room. 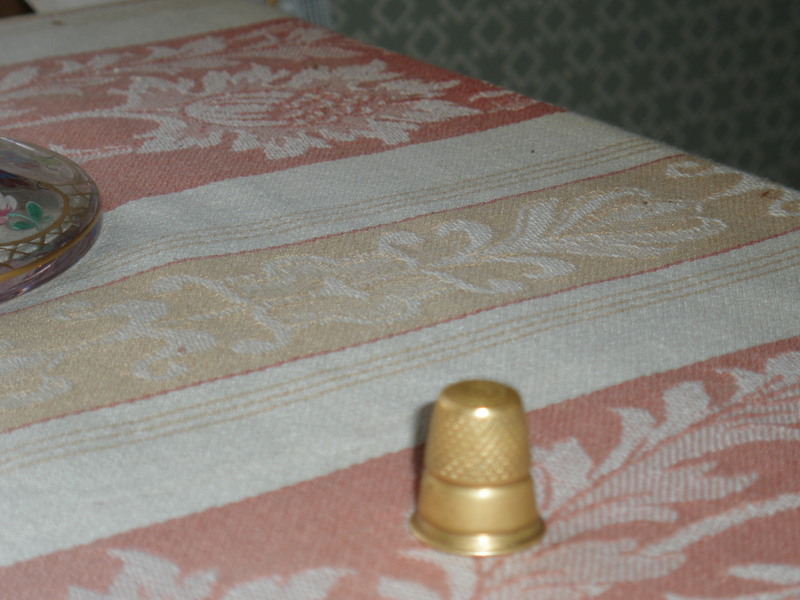 She or he had to put the thimble somewhere in plain sight (not inside or covered up by something). The other players then came back into the room and started looking. When they saw the thimble, the players tried not to give away where the thimble is hiding. Without saying anything, they sat down on the floor to show they knew where it was. The last player standing was the one who couldn’t find the thimble. This player would be asked to pay a “penalty”—that is, to do something silly as a penalty for not finding the thimble. The other players could ask him to stand on one foot and recite the alphabet. Or sing a silly song with his fingers stuck in his ears. Or to walk around the room like a chicken. Today, we have TV or video games to play with on a rainy day. Could you spend a whole afternoon playing with toys that did not need electricity? Or playing games that only needed a few props? See if you can do it! The next afternoon when rain keeps you inside, see if you can find ways to play that don’t need modern toys or electricity! Still need some ideas? Visit us this summer at the Tangen House, Flynn Mansion, General Store, or 1900 Farm for more ideas on how kids can keep busy on a rainy afternoon!